Epact: Horizontal Dial unsigned, circa 1600 ? This dial has the form of a small lute. 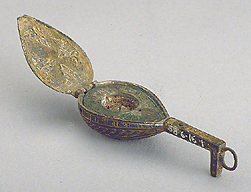 The very small size and design of the instrument together with the fact that it has a suspension ring show that it was not intended for practical use but more likely was used as a piece of jewellery. On the top of the lid was a glass (now broken) partially or completely gilt, and the hour lines for the actual string gnomon dial are carved on an ivory plate inside the body of the lute. The instrument is unfortunately not very well preserved.